Hello and welcome to my online studio. 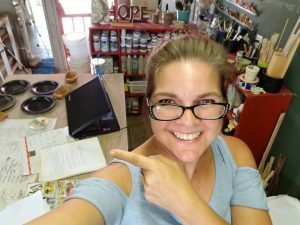 I’m Tammy Jo Schoppet, a wife, mother of 4, YouTube host and an AVID clay lover! It would just take me too long to explain my “sordid” clay history and all the learning moments I’ve enjoyed (both good and bad in over 500 YouTube videos), so I’ll just direct you to the beginning of my online clay journey. 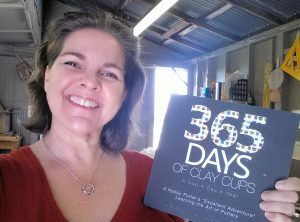 365 Days of Clay Cups a daily YouTube vlog, making a cup a day for an entire year. I am not a “teacher of pottery”, but consider myself more an “explorer of clay”. There is no guarantee my techniques or art pieces have perfect results every time. But I do promise to keep it real, share the joy-filled learning moments that happen in and out of my studio. Videos allow us to share the journey together and equally learn from each other! Thank you so much for visiting, and I hope you find something that moves or inspires you to get creative and grow! EXPLORE my YouTube Channel to see what I’ve been up to in the studio! If you enjoyed watching the 365 Day cup throwing project videos, you may also be interested to know there is a 300-page book and ebook showing all 365 before and after photos, journal entries along with the gallery exhibition. 1 week ago by hobbypotter These were the test pieces of mystery clay... results, they are probably earthenware not porcelain (because they turned yellow not white) still...I LOVE THEM! ... ... ... . . ... ... ... ..
3 days ago by hobbypotter Hurry Up & Dry faster! I know what I want to do with you! #impatientpotter !